As you read in Part I of Is Your Horse Ready for Summer, warm weather brings with it a unique set of challenges for horses and their owners. Here are three equine body parts that often get less attention than they should when it comes to sun exposure, heat, and humidity. Uveitis (AKA equine recurrent uveitis, periodic ophthalmalia, moon blindness, or ERU) is the number one cause of blindness in horses. Uveitis is an inflammation of the uveal tract of the eye. Whilst the exact cause is unknown, uveitis is associated with eye trauma, tumors of the eye, and autoimmune dysfunction following viral, parasitic, and bacterial infection (especially the Leptospira species). Some of the early signs of uveitis are the horse squinting in sunlight and watering of one or both eyes in bright sun. 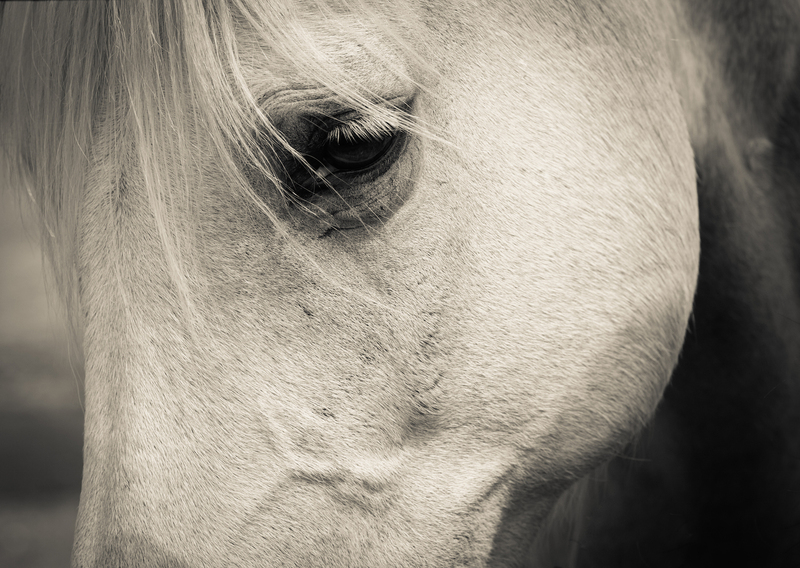 Horses that are known to have uveitis can have increased photosensitivity, where exposure to sunlight exacerbates pain and other symptoms of the disease. To lower your horse’s risk of uveitis, make sure your horse is not in proximity of stagnant ponds or long-standing water that can harbor insects and pathogens, which are particularly problematic during hot, rainy summers. Clean water troughs and refill water regularly, and use a fly mask when necessary, in addition to general fly control in the stables. Leptospirosis, an infectious disease caused by bacteria in the Leptospira family, is associated in equines with sharing close quarters with certain animals. If you raise cattle or pigs at your facility, ideally keep them separated from horses. Keep rodent infestations at bay and manure removed frequently. Horse companion animals should be examined by a veterinarian to prevent any inadvertent spread of illness. If your horse has been diagnosed with uveitis, limit your horse’s exposure to ultraviolet light by providing cover overhead. Consider riding early or late in the day. Monitor your horse’s symptoms and treat them as per your veterinarian’s instructions. Horses with light coat colors and lack of pigment around the eyes are more prone to uveitis, and they are also subject to sunburn when exposed to ultraviolet light. Equines with thin coats are also at risk. Areas of the horse that are most vulnerable are the face (especially the nose) and the heels, where there is little hair. However, any place on the body that is unprotected can become sunburnt. Some medications may increase photosensitivity in horses, as can poor liver function. Likewise, certain plants, like buttercups, when rubbed on the muzzle while grazing can cause photosensitivity. Check with veterinarians or plant specialists in your area, such as at the nearest university with an agriculture program, to learn which plants you should eradicate from your pasture. 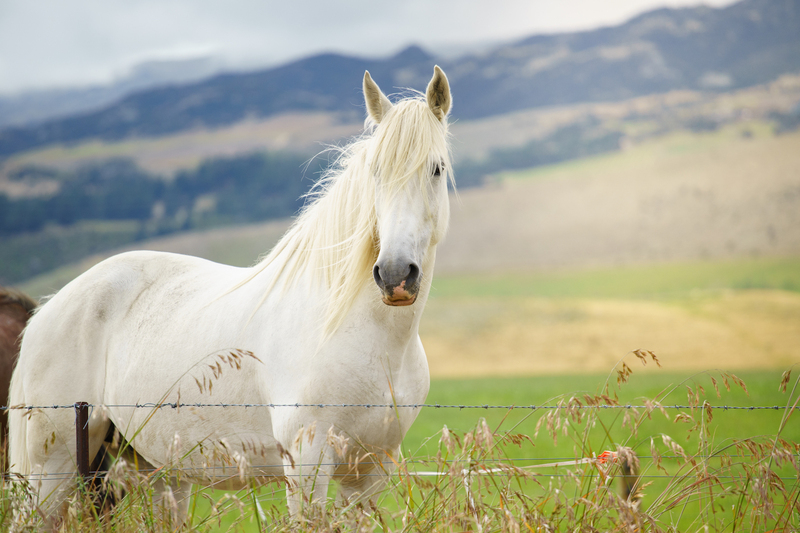 Just like in humans, sunburn in horses produces pink or red skin that may eventually peel. Over time, repeated sunburns can cause keratosis, or thickening of the skin. Keratosis can progress to squamous cell carcinoma and skin cancer, so obviously, you want to avoid it from the start. To protect your horse from overexposure to the sun, make sure that shade is provided throughout the day. While it may be tempting to allow your horse to graze in pasture during the long days of summer, you may need to turn out your horse when the sun is less direct at the start and end of the day. Equine sunscreens can be applied (some use colour, so you can see if you missed a spot). You may also use some children’s sunscreen lotions, but check with your veterinarian first to make sure the ingredients are safe. One of the most often overlooked parts of the horse’s body when it comes to summer protection is the feet. Whilst summer’s warmth typically makes soft tissues of the limbs feel better and move with greater ease, hooves can literally take a beating. “In warm, dry climates, the ground can become like concrete,” says Mark Silverman, DVM, MS, owner of Sporthorse Veterinary Services. Dr. Silverman works on elite equine competitors, including Olympians, in the San Diego area of southern California, where he specialises in equine podiatry issues. Whilst dressage riders usually have the advantage of soft footing in the arena, riders who train and compete on natural terrain, like eventers, need to exercise special care with their horses’ hooves. “The concussive effects of hard ground can be dangerous for the horse’s feet. Riders whose horses are subjected to that pounding may want to pack the feet after a ride with clay to draw out inflammation.” They may even want to pad the feet before riding with a shock absorbent material, advises Dr. Silverman. Dr. Silverman also suggests being selective about training in rings where it is hard for moisture to be retained. Riders may want to choose ride times immediately after watering the ring or work a horse that is less sensitive to hotter, dryer footing. Horses with chronic founder actually have more problems with ground that is constantly wet. A very dry hoof provides a kind of protective shell to the foot that helps with this condition. If you live in a rainy, humid summer environment and have a horse prone to founder, make sure it’s not standing in water, and provide footing that reduces moisture. As far as hoof conditioners go, Dr. Silverman doesn’t feel “normal” hooves usually need them. However, horses living and competing in moisture extremes may benefit from the use of a topical treatment. In very dry climates, a hoof conditioner can help the hoof retain necessary moisture, whilst in wet locations a hoof treatment will also repel excess water. Finally, if you are having difficulty with summertime weather-related hoof problems in your horse, Dr. Silverman suggests considering hot shoeing. “This seals off the tubules at the bottom of the hoof wall,” he says, “which theoretically provides more protection there against both moisture loss and too much moisture.” Perhaps something to discuss with your veterinarian and farrier?